War Damaged Musical Instruments by Susan Philipsz was specially commissioned by 14–18 Now, the official cultural programme for the WW1 Centenary commemorations. The work is a sound installation, which features recordings of British and German instruments which have been damaged by war. The notes recorded are based upon the tones of the military bugle call ‘The Last Post’, a tune that sounded at the end of a battle signaling to soldiers that it was safe to return to base but the tune is fragmented to such an extent that it is practically unrecognisable. Philipsz has worked with the architecture of the space devising a sequence of sounds that travel the length of the Duveen galleries, creating an immersive and contemplative experience. The New York Times – Hettie Judah. An Eerie New Sound Installation, Made From Broken Instruments. The Guardian – Adrian Searle. 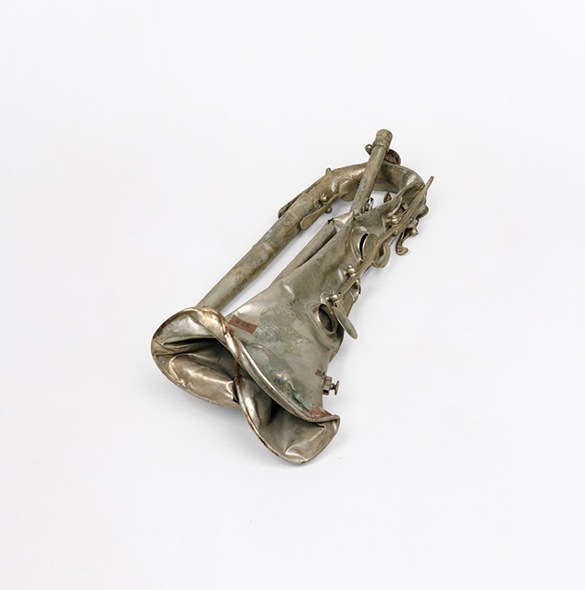 Susan Philipsz’ War Damaged Musical Instruments.